As I write this I’m sipping a glass of Pine Ridge’s 2009 Chenin Blanc/Viognier. But make no mistake, this piece is about Champagne. 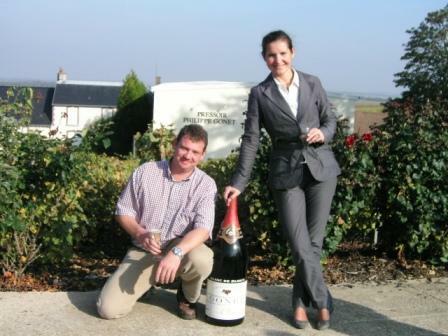 I recently had the pleasure of sitting down with Chantal Bregeon-Gonet, who with her brother Pierre Gonet run the Champagne House Philippe Gonet. This house specializes in Blanc de Blancs made entirely from Chardonnay, and their annual production is only about 200,000 bottles or about 17,000 cases. That may sound like a lot of wine, but to give you a reference point, one of the “Grand Marques” – Moet et Chandon – produces about 26 million bottles, or 2.2 million cases each year. You probably already know and have tasted wines from one of these big producers – other names include Veuve Cliquot, Taittinger, Perrier-Jouet, Krug and Pol Roger. Most of their wines are non-vintage; that is, they’re a blend of wines, typically from many different vineyards across Champagne, and from two or more years. Why? Well, they’re designed to taste the same year over year, so that you always know what you’ll be drinking. That’s not always true, but that’s the idea. And this consistency, supported by some rather expensive marketing, is supposed to make you become exclusively a “Krug (or Veuve or Taittinger or whatever) drinker.” But that’s up to you. 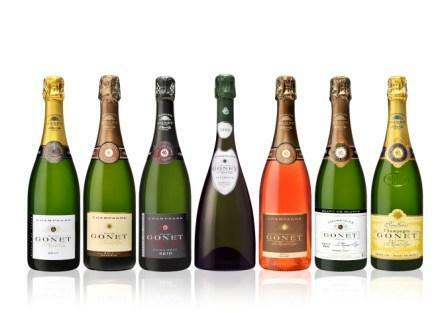 The Gonets are seventh generation family producers in Le Mesnil sur Oger, a commune (village) in the Marne department (something like a county or parish) in the Champagne-Ardenne region in northeastern France. Their wines are classified as Grand Cru, considered the best in Champagne, and their vineyards are bordered by vineyards of the much larger Krug and Salon houses. But here it’s the village where the vineyards are and not the vineyard itself that determines the classification, unlike the vineyard itself which reigns in Burgundy and the Chateau in Bordeaux. There are 17 villages in Champagne that are classified Grand Cru, and “Le Mesnil” as it’s typically abbreviated was elevated to that status in 1985. Anyway, Chantal and Pierre took over the business after their father’s unexpected death in 1990; Pierre makes the wine and Chantal travels the world, literally, marketing and selling it. Interestingly, she sells a lot in Asia, especially Singapore, Japan and Hong Kong, which seem to love small houses and grower Champagnes as opposed to the Grands Marques. I suspect, too, that she’s seeing a lot of interest in mainland China as that country continues its enormous development and economic growth, which includes a thirst everything western, Champagne certainly among them. Chantal was able to stop in New York recently to introduce her wines to a handful of NY- and NJ-based writers. Happily, she chose an iconic restaurant in the City, 11 Madison Park, to host us. Over three hours, with a little interruption for a three-course meal, we tasted all seven Gonet Champagnes. Now, her promotional materials will tell you that Gonet wines are listed in the Guide Hachette des Vins, La Revue du Vin de France and Decanter, that they’re recognized by the world’s best sommeliers and on the wine lists of some of the world’s best restaurants, etc. etc. That’s all true, but mostly irrelevant. What’s important is that I liked them – some, certainly, more than others – and whether or not you would, this is a Champagne house worth hearing about. Blanc de Blancs literally means, “white wine from white grapes.” It’s an important distinction, as many Champagnes and sparkling wines (wines made in the Methode Champenoise style) are made from a combination of Chardonnay, Pinot Noir and Pinot Meunier. There’s also a style called Blanc de Noirs, white wine made from just Pinot Noir and Pinot Meunier, which are red grapes. The Meunier (pronounced Mun-yay) is a somewhat obscure grape outside Champagne and when it’s used, it’s typically only a couple percent. And let’s take a moment to remember how “white” Champagne is made from 100% Chardonnay. It starts out as ordinary “still” wine – the juice is squeezed from grapes and placed in a big vat called a fermenter. Some yeast is added, which turns the grape sugars to alcohol and creates carbon dioxide, which is allowed to escape, and some heat too, actually. The product of that process is the “base” wine. If we bottle that up at the end of this process, we merely have…Chardonnay. But we don’t. Instead, we fill heavier, thicker Champagne bottles with that wine, but leave a little space in the neck. Then we add a little solution of sweet, unfermented grape juice and a tiny bit more yeast. The yeast goes to town on the sugar once again, but this time the bottle is capped, so the Carbon Dioxide can’t escape. Those bottles sit around for awhile, and instead of being bored or watching Oprah (is there a difference? ), the yeast continues to interact with the wine even after it’s done producing alcohol, making it more complex and interesting. When the winemaker says it’s time, the yeast is collected in the neck of the bottle and shot out, leaving crystal clear wine with all that carbon dioxide dissolved into it. The wine is now really, really, dry so to take the edge off, a little more sweet grape juice called the “dosage” is added, and then it’s corked and a wire cage is added to keep that good stuff securely in the bottle. And when you open the bottle (really, really try not to pop the cork) and pour that scrumptious wine into a flute, the dissolved carbon dioxide bubbles to the surface, making the wine as lovely to look at as it is to taste. As we walked into the lovely upstairs private dining room at 11 Madison, we were handed a flute of the Gonet 2002 Magnum – nicely acidic but rich and balance. Throughout the afternoon, this wine continued to get rave reviews from the group and many requests for refills. Sadly, this was a library wine from Gonet’s cellars and not available elsewhere. The first wine served with the appetizer course of risotto with mushrooms was the non-vintage Champagne Philippe Gonet Brut Reserve. This wine is the odd man out for Gonet, with red grapes amounting for the majority of the juice, Pinot Noir (60%) and Pinot Meunier (10%), and Chard only 30%. Still, it’s a Blanc, and to me the fruitiest and richest of the range as you might imagine. The next offering was the Roy Soleil Champagne Gonet, also a 100% Chard, non-vintage wine. I called it the “un-Champagne” as it was much softer and rounder, with about a third of it seeing some oak. It was absolutely the perfect wine with 11 Madison’s lobster entree and I’d say this is a near-perfect food wine. 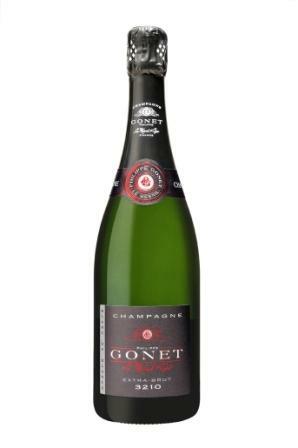 Next in the lineup was a vintage wine, Champagne Gonet Brut 2005. Bottled in March of ’06, the grapes came from a single area of the Gonet’s vineyards. Although this wine sees no oak, I found it rich yet zesty, with a prominent nose and a lot of fast bubbles. The non-vintage Champagne Gonet Rose Brut was delicious, complex with the slightly different mouth-feel you’d expect from a wine that’s 85% Chard and 15% Pinot noir. A lovely copper color, the strawberry aroma and flavors were nicely integrated and not overpowering, and more subtle than Roses made in the Saignee method. Surprisingly, my least favorite wine was the Confidentialle Edition Champagne Philippe Gonet Belemnita 2004 (Latin name of the chalky soil in which Champagne grapes are grown), yet it’s the most expensive of the house. Only about 4000 bottles were made and placed in this distinctive bottle with long, sloping shoulders and a blunt bottom. At about a buck-fifty, I’d say forget it and instead buy 3 of 4 bottles of Gonet’s other offerings! My favorite, for simple reasons, was the Gonet Extra-Brut 3210. This style Champagne is somewhat hard to find, and its austerity and crispness is off-putting to many. Not me. Remember what I said above – that to take the edge off the bone-dry wine, the dosage is added? Well in Extra Brut, it isn’t: no dosage. The label “3210″ which means 3 years of aging, 2 terroirs, 1 grape variety, and 0 dosage. The typical review of this wine will say “break out the oysters.” I say just enjoy this all by itself! Nice mousse (foam), a tiny bit yeasty, and vibrant citrus-y notes – Lemon and grapefruit – come through. This is one of the 5 best aperitif wines I’ve ever tasted. Fabulous. And Finally…Eight Questions for Chantal! What is your biggest market (country) and best selling label? My biggest market is France (50%) then Belgium (12%), and best selling label is Champagne Philippe Gonet Brut Reserve. It’s the easiest champagne, a classic blend of 60% Pinot Noir, 30% Chardonnay and 10% Pinot Meunier and the best value. But I prefer to push the Champagne Philippe Gonet Blanc de Blancs Brut because it is our signature, my favorite and 100% from our vineyards. How much has your business grown in Asia over the last few years? Are you selling into Mainland China as well as HK, and what’s your growth there? Do you sell into South Korea? I started to prospect in Asia when I was living in Singapore from 1997 to 2000. I first worked with Japan, which is still our biggest market in Asia (8%) then I really did a great job in Singapore—now 2%. My importers in Hong Kong and Beijing are both distributors and doing wine education, which is good because they organize lots of tastings with their students and that’s how our customers recognize the quality of Gonet, which is not a big name but most of the timer “bigger in quality.” I’ve worked in HK since that time but in China proper only for 3 years. Our growth there is slow but every year we reinforce our position. We sell also to South Korea to Duty free shops, and in Malaysia and India. We export to 20 countries! How important is the USA in your plans? Are you targeting a specific segment of the American wine consumer? USA is a strategic market because all the notes from wine critics, wine journalists and bloggers are very influential not only for the US market but also for the rest of the world. 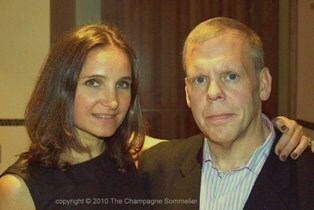 I am targeting especially the head sommeliers in top restaurants. I am sure we have excellent quality and above all with the Blanc de Blancs, all of them have the top terroir of Champagne region: the Chardonnay from Le Mesnil sur Oger. It is really a great soil and as long as you have Mesnil terroir in your Champagne the taste is different, especially the finish which as always is a remarkable, citrus-y taste that you cannot miss at the tasting. Then I think our Champagnes are also for real Champagne lovers who really appreciate the top Blanc de Blancs. But we have a large range that can also suit to anyone with the Brut Reserve. What’s your biggest challenge in differentiating Gonet from the Grands Marques? I will never have the budget to compete with the big names – but I’m sure that I can beat at the tasting! And surely in term of price. And I am travelling personally; this is probably a plus for the sommelier to meet me and be directly in contact with the producer. You’re not precisely a negociant but not a strictly speaking a grower Champagne producer either? How do you describe Gonet? We buy the equivalent of 5 hectares of Pinot Noir which is 25% of our production and those Pinots go only in the Brut Reserve. We could say that we are between growers and negociant. But we could be in a special category to be created: a boutique Champagne house and a family business. For our 5 different Blanc de Blancs, we grow the grapes which come from our own vineyards and we buy part of the Pinot of our Brut Reserve. My brother and I definitely think like growers because you can make a good champagne only if you get the top quality grapes. Each of our bottles is like a kid who you really believe in. We do not have the passion for marketing as much as for caring for our vineyards and making wine, and being proud of presenting our own “kids”. You focus on Blanc de Blancs. Is that a historical aspect of your house? Why? Personally I drink only Blanc de Blancs, my parents and my grandparents did so. Our palate is oriented for Blanc de Blancs. Historically until the 5th generation (my grandparents) the family had only Chardonnay vineyards. My father married a lady from the Vallee de la Marne who owned land in the appellation Champagne, exactly in La Chapelle Monthodon and Le Breuil, and my father planted those areas with Pinot Noir and Pinot Meunier. That is when we started the cuvee Brut Reserve, in 1972. It became the biggest item because it is probably the cheapest and the fruitier. We created in 2001 the cuvee Roy Soleil because my brother wanted to play with the Chardonnays from Le Mesnil and the barrels from Burgundy. In 2002 we started our first, top Belemnita Vintage. More recently in 2009, we created the Extra-Brut 3210 to focus on a very pure style like we love. Tell me about your Rose. It’s certainly a departure from a Blanc de Blancs! Our Rose is made of 15% Pinot Noir red wine from Vertus, next to Le Mesnil, and 85% of Chardonnay from Le Mesnil. My brother (the winemaker) wanted to make red wine because he studied in Burgundy and loved to make reds. Then we blend red and white wines just before the bottling. Our rose is really expressing our style, delicate and slightly fruity with a long finish like a pure Chardonnay. Where in the NYC/NJ area can people get your wines? This is very important!! !